"A story about the ugly truths about post college life: Crap jobs, crazy roommates, and vampire hunting loonies." 1001 Insomniac Nights follows a bitterly sarcastic college graduate as he hazards the ugly truths of post-college life: crappy jobs, crazy roommates, and vampire hunting lunatics. Complicating matters is a very determined would-be girlfriend, a self-proclaimed guru-for-hire, and a pair of not so helpful bounty hunters. 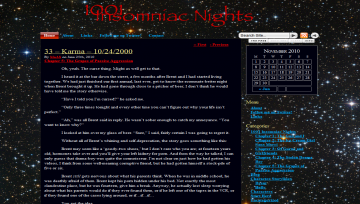 1001 Insomniac Nights has not been tagged yet. Help others find 1001 Insomniac Nights by tagging it! 1001 Insomniac Nights has not been reviewed yet. 1001 Insomniac Nights has not been recommended yet.